Are we really in “recovery”. A comparison of predictions made in the 1970’s in the Limits to Growth study, suggest we may be heading toward collapse instead. Key to the theory advanced by Dr. Graham M. Turner of the Melbourne Sustainable Society Institute, University of Melbourne, is that more and more capital will be diverted into getting difficult oil and gas (fracking, Tar Sands, deep water drilling) – with less available for manufacturing and consumption of products. In the decline, you and I get less purchasing power. At some point, the global system collapses – perhaps even before climate change delivers devastating extreme weather. On the other side, Linda Doman, chief energy analyst for the US Energy Information Administration predicts the world will use even more oil and gas as the decades advance. Oil use by OECD countries (US, Canada, Europe, Japan) hit a peak in 2005, but continues to ramp up in India, China, and the Middle East, swamping our gains from energy efficiency. 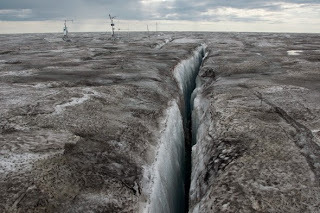 Dr. Jason Box, the Danish ice specialist, has released stunning pictures of normally white Greenland turned sooty black. It’s partly from coal burning and general pollution. But another boost of black soot comes from record fires in the Canadian Boreal forest and Arctic this year. Black soot is a warming agent of it’s own, absorbing more of the sun’s heat over vast northern areas – instead of reflecting sunlight back into space. Northern forests are becoming a carbon source, instead of a carbon sink. Our guest Marc-Andre Parisien is a wildfire specialist with the Canadian Forest Service. Or you can listen to (and download) it right now on our Sound Cloud page. The heads-in-the-sand photo taken The Strand beach in Townsville, Australia is in response to lack of action on climate change. Photo: Cranky Curlew Productions. That is the title of a new research paper, which adds “An Updated Comparison of ‘The Limits to Growth’ With Historical Data”. The author and our guest is Dr Graham M. Turner. 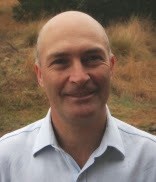 He is a Principal Research Fellow at the Melbourne Sustainable Society Institute, part of the University of Melbourne in Australia. Find this paper here. It’s not a difficult read, and well worth your time. You can also read this interesting take on the paper by Graham Turner and Cathy Alexander in the Guardian newspaper, September 2, 2014. This is Turner’s second review of the Limits to Growth. His first was in 2008: Turner, G.M. 2008 “A comparison of The Limits to Growth with 30 years of reality” Global Environmental Change, 18, pp. 397-411. The original “Limits to Growth” study in the 1970’s helped shape the entire environmental movement. It was remorseless trashed by pro-business writers, as proven wrong, and consigned to the dustbin of history. Now many of us sense we are teetering on the edge, so I’m really pleased to have this opportunity to talk with Dr. Turner. Keep in mind, Graham Turner is not absolutely PREDICTING an imminent global collapse. His research shows we are following a path that could lead there. I asked him what signs we should watch for, and one suggestion was infrastructure falling apart. You know, bridges falling down, sewers that don’t work, things don’t get repaired. Why? Because governments, corporations (and you) will have to put more and more of our social capital into simply getting more fossil fuels. Think about the costly Tar Sands, deep water drilling, Arctic drilling – these are very capital intensive. As the cheaper easier oil (like from the Middle East wells) gets used up, it will cost more and more to get less and less. Richard Heinberg has released a study saying this applies even more to fracking, as wells run dry quickly, needing more and more expensive drilling. The charts which Turner presents in his paper, showing predictions made by the MIT group in the 1970’s Limits to Growth track very well with what has actually happened in the more than 30 years since. We don’t have to guess. We can measure what happened, and he does. All the signs point to an eventual collapse of our current system, perhaps our civilization as well. WILL WE BURN 30% MORE LIQUID FOSSIL FUELS IN 2040? There is another world out there. That’s the flow of business, oil, and governments toward an increasingly high-carbon future. It’s stunning to consider, but the majority view is the world will produce, consume, and burn ever more oil, gas, and petroleum produced from coal. Check this out. I’m on a ton of media press lists, including several from the U.S. government. An American government department has just predicted the world will increase the supply, demand, and consumption of liquid fossil fuels (oil, gas, and petroleum products converted from coal) as this century progresses. Is it a nightmare, or just the hot reality? We are joined by Linda Doman, the lead energy analyst for their publication, the “International Energy Outlook”. Their latest report, released September 9th, 2014, is from the U.S. Energy Information Administration, the EIA. You can download or read that EIA publication online as a .pdf here. “The projections in International Energy Outlook 2014 (IEO2014) are not statements of what will happen, but what might happen given the specific assumptions and methodologies used for any particular scenario. The Reference case projection is a business-as-usual trend estimate, given known technology and technological and demographic trends. EIA explores the impacts of alternative assumptions about oil prices in a low-oil-price scenario and a high-oil-price scenario. The price cases examine a range of potential interactions of supply, demand, and prices in world liquids markets IEO2014. All of the cases generally assume that current laws and regulations are maintained throughout the projections. Thus, the projections provide policy-neutral baselines that can be used be used to analyze international energy markets. So what does this report really say about coming oil and gas demand and production? First of all, they don’t foresee a huge rise in prices, which is an important factor in consumption. Oil may be $140 2012 dollars in 2040 they say, although several scenarios are contemplated. Production is expected to increase from the current 87 million barrels a day in 2010 to 119 million barrels a day by 2040. That’s about a 30% increase. When you consider we are already putting record amounts of carbon dioxide into the atmosphere now, with extreme weather as a result, fires, floods, rising seas and all that – a 30% INCREASE as the century goes forward must be absolutely disastrous. But that’s not the concern of the EIA, which is only concerned with plotting our trajectory from the now. Linda Doman tells us production expectations have been raised from the 2013 report, due to the extra production from fracking. They expect fracking to expand from it’s base in the United States to countries all over the world. The EIA says use of oil and gas in developed OECD countries (U.S., Canada, Europe, Japan) peaked back in 2005. More efficient cars, savings by power companies, and an economic recession have all helped push consumption back in these countries. But that is overshadowed, in fact increased, by higher demand in Asia (China, India, Indonesia mainly) and in the Middle East. Why the Middle East? 1. The young population is coming of age to get driver’s licenses. 2. Oil producing governments subsidize fuel prices (like 25 cents a gallon for example) which doesn’t limit demand. And 3. (which I will add) – there is a movement toward more industrialization in some Middle East countries. They will consume their own oil and gas in petrochemical refineries, and other manufacturing activities. There is still a lot of uncertainty about how much oil and gas China and India will burn in the future. The EIA created three possible scenarios. In the highest use picture, BY 2040, India and China would consume about as much in liquid fossil fuels as the whole world does today. That is truly frightening if it happens. Where will all this oil and gas come from? From fracking for sure. But the EIA also expects more millions of barrels from OPEC members. Plus countries like Iraq and Mexico have not developed their full potential, partly due to lack of investment and infrastructure from larger oil companies and international banks, Doman suggests. It would be very interesting to get Richard Heinberg’s response to this report. I’ll send him a link, and see what he says. In the meantime, I thought you should hear what the experts are saying about our carbon-rich future. Download or listen to this short interview with Linda Doman here. If you REALLY want to dig deep into fossil fuel projections, here is the You tube recording of a presentation September 22nd 2014 by Adam Sieminiski, the Administrator of the EIA, on this very report (the International Energy Outlook for 2014). Slate Magazine is running a stunning story “Why Greenland’s ‘Dark Snow’ Should Worry You.” Don’t miss those photos from Danish scientist Jason Box. They show what should be the white ice and snow of Greenland have turned dirty black. That means the surface absorbs far more heat from the sun, instead of reflecting light back into space. Expect record ice melt, and another jump toward rising seas. Where does that dirt come from? Certainly from coal power plants in America and China. From polluting industries in Europe and Russia. But I suspect the largest amount comes from soot. Siberia has plenty of fires, but northern Canada just experienced the greatest fire season ever recorded. A Canadian scientist calls them “a major event in the life of the earth system”. The soot from these fires may be a primary cause of Greenland turning from white to dirty black. Regular Ecoshock listeners know wildfires in the Arctic are bigger and badder than ever. Scientists predict a huge increase over the coming decades due to changes in climate, and various feed-backs triggered by global warming. Could the whole boreal forest burn down? New research has taken us deeper into fire behavior in the far north. The paper that caught my eye is titled “Resistance of the boreal forest to high burn rates.” Our next guest is one of the authors. Marc-Andre Parisien is a research scientist for the Northern Forestry Centre of Natural Resources Canada’s Canadian Forest Service, located in Edmonton Alberta. Along with scientists at the Centre for Northern Studies in Quebec, Parisien is an author of the new paper “Resistance of the boreal forest to high burn rates” published in PNAS, the Proceedings of the National Academy of Sciences on August 4th, 2014. You would need to be a paid member of PNAS to read this, but find the abstract here. Marc most of us can barely imagine the size and condition of the great Boreal forest. It runs from Alaska right across the whole of Canada to Labrador – and that’s just in North America. There is more in Scandinavia and Siberia. Television doesn’t report on fires in Canada’s far north. Most of these blazes run their course with no one trying to put them out. How large can a fire get? A single large fire can be bigger than the island of Manhattan, which is 9,000 hectares, or more than 22,000 acres. One fire in the Canadian province of Quebec was 560,000 hectares, or 1.3 million acres. This summer of 2014, Parisien tells us, over 4.6 million hectares of forest burned (11.3 million acres) – that is larger than Switzerland. It’s a stunning amount of carbon taken from trees and forced into the atmosphere. That is when forests become a carbon source, rather than a carbon sink. It’s also a huge burst of black soot, a global warming agent on it’s own, and a contributor to the blackening of Greenland. There are very different estimates for the increase in northern fires as the planet warms. By 2100, some scientists suggest forest fires in that region will increase by 30%. Others have suggested they might increase by 500%. If that becomes reality, we can doubt whether northern forests will continue to exist. The one possible saving agent, and the point of the paper by Parisien and scientists from a Quebec University – statistically, forests that burned within the last 40 or 50 years are LESS likely to burn again in our time. It looks like there is a kind of negative feedback loop at work here, at least for forest fires. However, I feel all that is uncertain as the Boreal and Tundra continue to heat up much more than the rest of the planet. We’re running a big experiment here on planet Earth. In this interview, Marc-Andre notes that fires are not the only threat to northern forests. As the permafrost melts, trees can lose their hold in soil, tipping over in a phenomenon known as “drunken forests“. These can already be seen in Alaska and the Yukon. We may also see changes in hydrology (when it rains or snows) as the planet warms. And forests have already been hit hard by changes in insects, like the Rocky Mountain Pine Bark Beetle which is killing off whole valleys of pines. These were enabled in such great numbers by a continuing lack of winters cold enough to kill them off. We didn’t have time to talk about the other big threat: logging the Boreal forest. It’s huge, all for toilet paper and other items we throw away. Find out about endangered Boreal forest logging at Greenpeace here, Forest Ethics here, or Canopy here. Marc-Andre listed other Canadian scientists who are studying the impacts of climate change on fires and the Canadian northern forests (despite Stephen Harper, the Prime Minister of the Tar Sands). He also recommends this web site: the Canadian Wildland Fire Information System. There you can find all kinds of helpful maps, charts and information. It’s a super resource for those who care about what happens in the North. Since the future of the world may be partly determined by what happens there, that’s you and everybody else in the world. Next week we’ll find out why the U.S. government, and governments around the world, are lying to themselves, and us, about the true threat of methane gas. A group of top climate scientists have written a powerful letter to change that. Join us next week on Radio Ecoshock. You can find all our past programs, as free mp3 downloads, at our web site, ecoshock.org. Don’t forget our Soundcloud page. My special thanks to the hardy band of people who support my reporting with a monthly $10 donation. Find out how you can help here. I’m Alex Smith. Thank you for listening, and thank you for caring about your world. ← Why Lie to Ourselves About Methane? I thought it was spelled that way too. but according to the Miriam Webster dictionary and many other sources, the spelling is correct: immanent. Maybe there are two ways to spell it? Immanent and imminent are different words with different meanings that just happen to be spelled similarly. Alex, the Prince EA song is beautiful; thank you for sharing it. Thanks Uncle Bob. I looked at the original paper and it says "imminent" – so I'll go with that. I've corrected it in this blog. Yeah, a listener suggested that song by Prince Ea. I'm sorry I can't remember who exactly gave me the tip, but I appreciate all the tips I get from listeners. Couldn't do the show without them really. "All political systems that I know of, and most kings, have moved their whole nation to desert. And the things that we saw as most proud– the cities and the canals and irrigation and so on– are the things that killed their cultures. And it continues, unabated. If people don't seize power back, and make their own gardens, and sit in their own gardens of Eden, then we're all doomed, and the whole world ends in dust." Premise Three: Our way of living—industrial civilization—is based on, requires, and would collapse very quickly without persistent and widespread violence. Premise Six: Civilization is not redeemable. This culture will not undergo any sort of voluntary transformation to a sane and sustainable way of living. If we do not put a halt to it, civilization will continue to immiserate the vast majority of humans and to degrade the planet until it (civilization, and probably the planet) collapses. The effects of this degradation will continue to harm humans and nonhumans for a very long time. Premise Seven: The longer we wait for civilization to crash—or the longer we wait before we ourselves bring it down—the messier will be the crash, and the worse things will be for those humans and nonhumans who live during it, and for those who come after. Premise Nine: …if we do not talk about our predicament and what we are going to do about it—the violence will almost undoubtedly be far more severe, the privation more extreme.